Founded in 2015, Taiwan Circus Gate is composed of a group of young, excellent performers full of dreams and energy. They combine traditional juggling and modern special effects and use multiple performance elements to fascinate audience’s five senses, conveying the unique beauty of modern circus arts. New circus arts has its own charm that opens up the audience vision and way of thinking. It has been constantly evolving as other art fields. 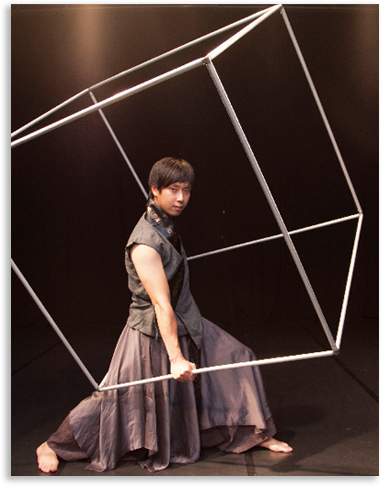 Members of Taiwan Circus Gate dedicate themselves to diligent practices, continuous bold experiments for more possibilities out of enthusiasm and perseverance. They often remind themselves to remember the original dream and their true selves so that they won’t be lost along the journey. Their performances today include【cube juggling】,【the magic 8-ring】, and【the big hoop】. All show harmony between strength and beauty through the performer’s special stage styles, leading the audience into a multiple-dimension world as popping geometric images flip and turn around instantly. It is a short but magical trip; illusion and reality overlap in this “spherical heavens and flat Earth” created by Taiwan Circus Gate. Peng Wei-Hann is a graduate of the National Taiwan College of Performing Arts, who has dedicated his time and passion almost exclusively to busking for many years. 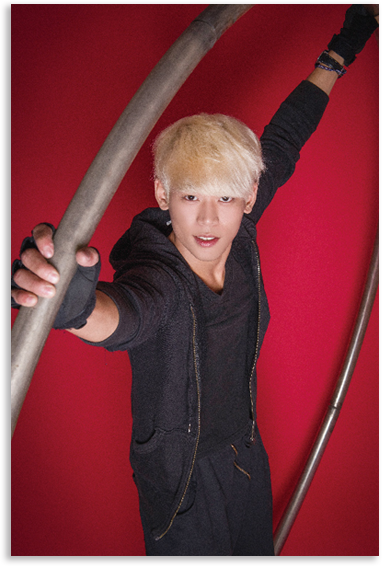 He also represented Taiwan at the Cuban International Circus Festival in 2016. Through observations of social life in the world, he realized that modern people needed more love and hope in order to carry on everyday living. He then developed his Cyr Wheel performance that carries with it the quality of “Spirit of Hope” to comfort people’s hearts and help in connecting them to the portal of a new beginning – with all of his earnest best wishes for the audience. Chen Zhuo-En graduated from the National Taiwan College of Performing Arts. The program titled “Devil Sticks juggling act” showcasing his performance and found on the YouTube channel KUMA received a one million-click-through-rate in 2015. More recently he has focused on experiments in Cube Juggling, hoping to break the traditional mould and step into new artistic territory. He muses that Cube Juggling is like the limitation of human life, and that to break through the wall of 3D illusion one may find a way out.